Get set for a night of laughter as the hilarious show One Man, Two Guv’nors takes to the stage. Stewkley Players, known for their very professional productions, are presenting the comedy in the village hall from Wednesday March 22 through to Saturday, March 25. Producer Erica McDonald decided to bring the show to Stewkley Players after seeing it in London and Northampton. Written by Richard Bean, the play is based on a comedy originally written in 1746 by Italian playwright Carlo Goldoni called Servant of the Masters. Set in 1963 Brighton, the play centres around out of work skiffle player Francis Henshall who becomes separately employed by two men - gangster Roscoe Crabbe and upper class twit Stanley Stubbers. Francis tries to keep the two from meeting, in order to avoid them learning that he is being paid by both. 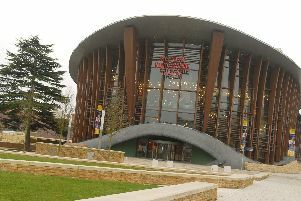 I saw One Man, Two Guv’nors with James Corden in the lead role when it came to the Waterside Theatre in Aylesbury several years ago after opening at the National Theatre in 2011 and I have never laughed so much in my life. There are several twists and turns to the plot which I don’t want to give away in this preview, otherwise it will spoil the many laugh out loud moments of a show where the element of surprise is vital to the audience’s enjoyment. I have seen several Stewkley Players shows and have always been impressed by the quality of their cast, so I have great expectations for this production and look forward to seeing it. Performances start each evening at 8pm, with doors opening at 7.30pm. Tickets cost £6 and include the programme. They are on sale now from the box office on 07845 489167, or call into the village hall between 10am and noon on Sunday (March 19).